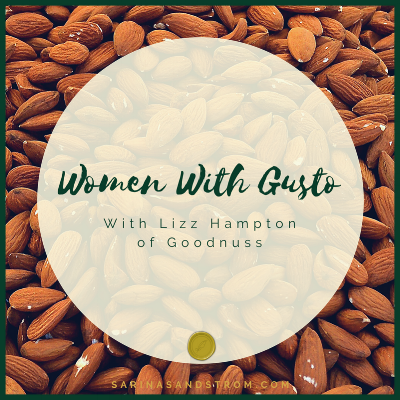 Welcome to another installment of Women with Gusto: a series where I share my chats with fabulous Gusto-driven women that I've had the pleasure to meet. The hope is that their beautiful paths to purpose can inspire you to follow yours and to not settle until you too, are living the life you dream of and deserve. Take just one minute to sit down and talk with Lizz and you will realize how contagious her enthusiasm is! I truly believe she is one of the most charismatic individuals I have ever met...and it does her well! Lizz is the founder and CEO of Goodnuss, a nut milk innovation company based in Portland, Oregon. Goodnuss' mission is to bring healthy, cold-pressed homemade nut milk to everyone without the mess of traditional methods. But that isn't all. 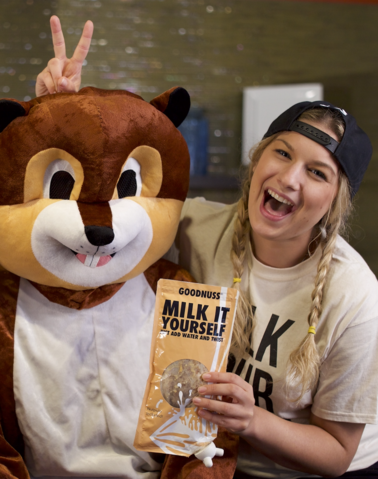 Lizz and Goodnuss are on a mission to grow the "Milk It Yourself" Movement and encourage consumers to understand the immense benefits of nut milk for your body, animals, the planet, the economy and more! When I asked Lizz to describe who she is and what she does she said, "I am an innovator. I am an entrepreneur. I'm the Nutress of the World! My happy place is finding ways to fix things by means that don't exist yet. I love to solve problems and make things...and I'm completely original. My purpose is innovation and leadership." She is passionate about improving lives through innovation and creativity. She realizes the importance of discovering and understanding yourself in order to succeed. She sees the opportunity and growth in any challenge, big or small. She is incredibly resilient and just doesn't quit...which leads her to mega success. She values connection with others on a deep level and thinks about how we can all help each other out. She has a knack for blending business and fun...you CAN have both! She has a contagious charismatic personality that amps you up about just about anything. She realizes the value you can gain from listening to mentors, friends, or everyday folk and their amazing ideas. She encapsulates the idea that everyone has their own path and that success is all about making life work for you...even if it is non-traditional. Lizz was a product design major in college and she has an interesting thought about how that experience transformed her and helped her learn more about herself. She says, "I'm not a very good designer but my portfolio is completely original." She prides herself on finding new and innovative ways to solve problems...and she's right...she IS original. Three of her original ideas have now become thriving business...talk about solving problems! But Lizz doesn't claim this all on her own. She shared that one of her biggest tips is to truly LISTEN when people are telling you things. Really HEAR them. Whether it is about something you are great at, something you need to improve, or something they have experienced that can help propel you forward. Take the lessons everyone shares with you and hold on to those that serve you. "Take advice but stick to your own vision...a filter is key if you don't want to feel overwhelmed!" One thing I've learned about Lizz through speaking with her and getting to know her is that she is all about self-improvement. She is constantly observing herself, taking in the notes and advice of others, and using these to improve herself and further her business. So what has she learned that she believes has pushed her forward? To JUST NOT QUIT. If there is one thing you can say about Lizz, it is that she is resilient as hell. She is one creative lady...and not just in the traditional sense. She brings creativity with her into all aspects of business...even strategy. She says, "You can have creativity without strategy, but you can't have strategy without creativity." She says that succeeding as an entrepreneur requires flexibility. It is about wearing many hats, and about being comfortable in that discomfort. Use creativity and self-discovery to move mountains. How do you learn best? How do you achieve? How are you being perceived by others? How can you delegate? What resources can you tap into? How can you find non-traditional ways to reach your goal? Are you coachable and how can you prove you are? It's important to know what you are good at and where you need to improve. "There is no magic formula! Everyone's path is different...it's all your own journey." And my FAVORITE quote from my interview with Lizz... "Don't just think outside the box, BE outside the box." Lizz is an extremely creative individual, and that shows up in the way she lives her daily life. Though she tries for consistency in routines and schedules, it doesn't always happen that way. As Lizz explained, "As an entrepreneur, every day is so different." Consistency is rather difficult, but finding ways to fit in the essentials is how Lizz finds success. She loves working out in the afternoons with a friend. She never skips breakfast and enjoys having a basic morning routine when she wakes up. But she also loves having the flexibility to live a life where some days she is working quietly at home and others she is able to hop to a meeting with an investor. This ability to be creative and flexible is her definition of flow! She is learning the true benefits of purpose and flow through experience. She says it is incredibly important to create a life, "where you don't want to check out." A life that you are EXCITED to get up and live each morning. When you find this, it is so much easier to avoid engaging in destructive behaviors or things that will knock you off course...and as an entrepreneur, that is incredibly important. A tidbit that Lizz shared which I think we can ALL benefit from is this: "As entrepreneurs, we are always comparing ourselves but all we see are revised stories. We aren't seeing the struggle. We are seeing what people want us to see. You can't compare your chapter 5 to someone else's chapter 15." So do you and be CONFIDENT in where you are...it's exactly where you need to be. Lizz did share an idea which I think many of us can relate to. Analysis Paralysis: the state in which you think and research and try to understand to a point where you don't actually take action. We've all done it. We want things to be perfect or to know for certain something is going to work before we take the risk, but as Lizz says, "Everything works in theory until it doesn't...you never know until you try." She encourages entrepreneurs to try their best to stay out of this state. Sometimes jumping into action will feel uncomfortable but in the end, doing is ALWAYS better than wasting your time overthinking. Stay actionable! As for the future of Goodnuss, it's growth time! Goodnuss is in the midst of a major funding round and hopes to put out product to investors by the end of 2018. Lizz's goal is to create a business whose work environment allows employees to explore their creativity and find innovation in fun ways. She is excited to offer product line extensions, grow the business, exit, and start innovating again! To infinity and beyond! A HUGE thank you to Lizz for sharing her charisma, advice, and empowering story with me and other fabulous female readers. I hope you are feeling even more empowered by Lizz and her creative & innovative perspective on the world. To all the women out there, you are extraordinary. You have so much value to bring to this world and you deserve to live a life fueled by passion and great enthusiasm. A life of GUSTO! Keep shining your light. Is Clarity an Illusion: Enemy of Happiness or Friend of Progress?